Ripple Price is surprisingly ranging within a 6-cents zone. Although participants are raving about Ripple (XRP), prices are stable and confined within a 6 cents trade range. Unless otherwise there are sharp gains above 40 cents, we shall recommend taking a neutral stand. Interestingly, XRP—a coin which we all saw erupt from 25 cents a while back, is close to becoming “stable.” XRP is up a mere three percent in the last 24 hours and virtually unchanged in the previous week against the greenback. At this rate, it is clear that prices are accumulating and founding the bases for the next upsides that would probably lead to a retest of Sep 2018 highs. In the meantime, fundamental developments are far and in between meaning technical candlestick formations are what traders use to fine tune entries in lower time frames. It seems like Binance came late to the XRP base party. Days after it listed XRP as one of the base pairs in their ALTS category, Bitrue traders have the option of trading four XRP base pairs in HOT/XRP, NT/XRP, NPXS/XRP, and PRO/XRP. It is no surprise because the exchange made XRP base on launch date and this was just a formality increasing options for coin traders. XRP prices are not only oscillating within a minor 6 cents zone but prices are ranging within Dec 28 high low. Although we are settled on bulls and looking forward to strong gains above 40 cents, we are resigned to staying neutral as this accumulation stretch. Technically, candlestick formation hints of bulls thanks to events of mid-Dec 2018 but unless otherwise there are confirmations, we shall best trade in line with previous XRP/USD trade plan. In that case, only sharp gains above 40 cents accompanied by above average volumes would probably sling prices back to 80 cents. If not and XRP drop below 34 cents—Dec 28 lows and even 30 cents, chances are XRP will sink below 25 cents erasing Sep 2018 gains. Volumes are low—way below the Dec 24 bulls—124 million versus 54 million average. As prices accumulate, the breakout bar volumes should exceed current transaction averages. Disclaimer: Opinions are those of the author. Do your Research. 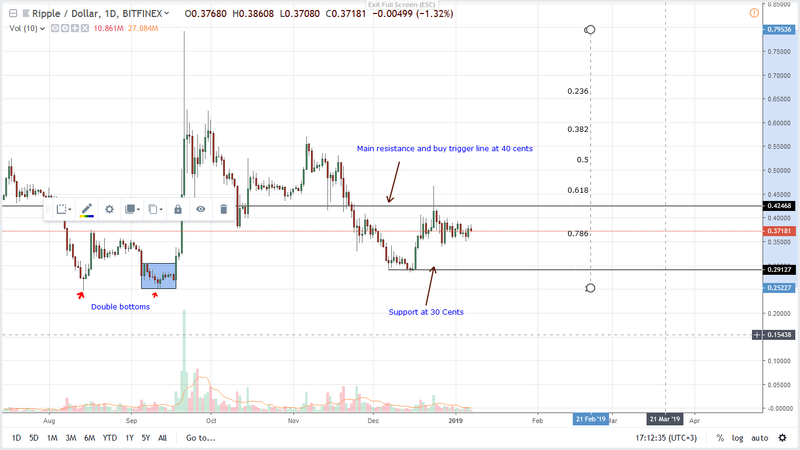 The post Ripple Price Analysis: XRP a “Stable”, Range-bound appeared first on NewsBTC.